This is a perfectly maintained ONE owner 2640 ROBALO "WALKAROUND" powered by Twin 200HP Mercury Salt Water Series Outboards with low hours. She is a great Family Fishermen. Has an enclosed head and V-berth that sleeps 2 which makes it a great overnighter. The head is to starboard and has a sink, mirror, storage compartment and head w/pumpout. Across from the head is the galley with sink, AC/DC frig, and a nice sliding drawer storage area above the countertop area. 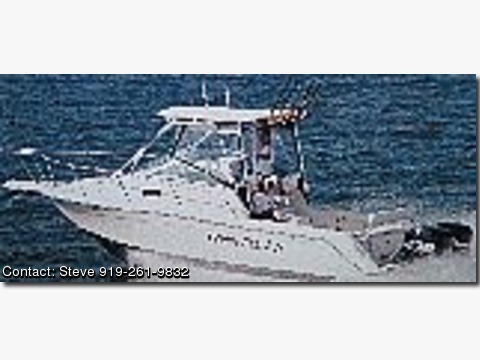 The 2640 is a well constructed 23 degree deep vee family fishing boat that delivers all the necessary fishing amenities together with comfortable cabin accommodations. Highlights include aerated live well ,bait box, 2 fish boxes, bait-prep center, twin transom doors. Her deep vee hull delivers a comfortable ride and her wide 8' 11" beam opens up the cockpit and cabin dimensions. Measurements LOA: 26� Beam: 8�11� Draft: 2�11� Dry Weight: 5,500 lbs. Bridge Clearance: 8�11� Engines Engine(s): MerCruiser Engine(s) HP: 200 Engine(s) Model: Salt Water Series Cruising Speed: 25 mph Max Speed: 40 mph Tankage Fuel: 162 gals. Accommodations Sleeps 2 Galley with sink,refrigerator Enclosed head with manual head with holding tank and mascerator Electrical 110 Volt Shorepower (AC) 12 Volt Ship Power (DC) Dual battery Switch 2 batteries 1 shore cable Parallel start switch Deck Factory Fiberglass Hardtop Anchors Trim Tabs Wipers Cockpit washdown Steel Bow and safety rails Bow pulpit Deck Fish boxes Tackle Center Bottom Paint Electronics/Navigation GPS Depth sounder VHF Additional The boat is ready to go.